Comes with two beaters and a height adjustable metal stand. Steeldrums have been built for over 50 years and we are proud to carry steeldrums from a German manufacturer with twenty five years of experience. They have done extensive research and development and have the best quality available. High craftsmanship and tonal purity up to the 5 overtone guarantees a sound volume that other manufacturers using thicker material can not meet. 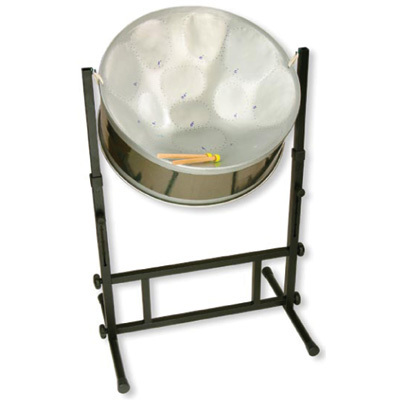 Improvisation is something everyone can experience with our classical pentatonic steeldrum. You can wander over the sound areas with the mallets and melodies begin to form. They can be repeated or changed as you journey on. Intonation from the right to the left..